Join the MSU Alumni Association in supporting Beaver Athletics. Stop by and visit our tailgate spots before each of the home football games. Tailgate spots will become available June. If you are interested in purchasing a spot please visit www.msubeavers.com. The Alumni Association will also be selling tailgate tents for these spots. Call the Alumni office at 858-3234 to reserve yours today! Go Beavers! Tailgating has moved to 11th Avenue! Note: Tent stands 9 ft. x 8 ft. with 6 ft. clearance. Sets up in just minutes. Tents will look the same as the one pictured. 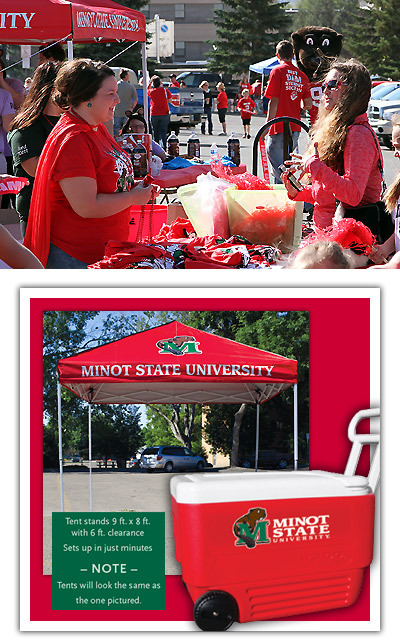 Contact the Alumni Office at 701-858-3234 or alumni@minotstateu.edu.